Successfully Added VKWorld F1 Android 5.1 Smartphone – Quad Core CPU, Dual SIM, Bluetooth 4.0, Smart Wake, 4.5 Inch IPS Screen (Black) to your Shopping Cart. 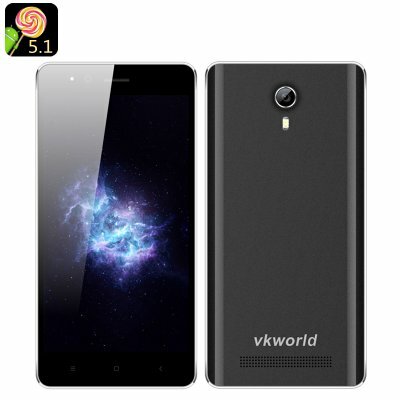 The VKWorld Android smartphone comes with the support of two SIM cards, letting you efficiently split personal and business accounts and always stay connected. You will have Android 5.1, quad core CPU, Bluetooth 4.0 and pother features as well. The smartphone comes with a budget-friendly price tag , while providing you with lots of great features. The VKWorld F1 comes with a nice set of features. It’s a practical smartphone at a great price, and will suit anyone looking for functionality and reliability on a budget. The Android smartphone comes with two SIM cards and supports a rather wide range of networks: 2G (850/900/1800/1900MHz) and 3G (WCDMA 850/2100MHz), letting you stay connected in any part of the globe. Unlike a great deal of modern smartphones, the VKWorld F1 won't burden you with a super large screen. Instead, it will give you a high quality 4.5 inch IPS display that is super easy to operate with one hand and fits into your back pocket. Despite its small size, the 4.5 inch display will offer you great quality for all your games and media playback. The phone comes with two cameras and a 1850mAh for up to 3 hours of continuous talk time. You will have 8GB of internal storage and the option to expand that with 32GB extra on an SD card. You will also get quick access to favorite apps from the locked screen thanks to Smart Wake and fast wireless connectivity with other devices thanks to Bluetooth 4.0.
very comfortable and beautiful phone for this price . THANKS !